I saw Elizabeth: the Golden Age last night. Many critics are pretty down on this movie - and I have to say, for good reason. Let's do a good, old fashioned "good, bad, ugly" on this film. The good - Obviously, the costumes get first mention here. They are beautiful, gorgeous, rich, sumptuous... everything you could possibly ask from a period piece about Elizabethan times. I'd like to give a special shout to the men's costumes, as they aren't as flashy as the women's, but I think show all the more elegance and beauty for it. There is one exception to my comment about costumes, but I'll get to that later. Of course, much of the acting I have to mention under good as well. Cate Blanchett does an amazing job with a - well, we'll get to the script later. Samantha Morton (whom I seem to love in every movie I see her in) is superb as Mary Queen of Scots. I loved when she looked up and said, with all the dignity of a queen, "I forgive you with all my heart" (the director decides not to let you hear this line - but I know my Mary Stuart). And Geoffrey Rush is, unsurprisingly, a god amongst mortals - he makes his Walsingham by far the coolest character in the movie. I'm hoping for a nom for him, come Oscar time. The bad - Oh dear. This script came from where? Melodrama and pseudo-vague historical events. Actually, it seems like the writers didn't actually read any of the history of the defeat of the Spanish Armada and what followed after - we get told at the end that everything was rosy and great after that. Elizabeth's famous speech to her troops at Tilbury, where (in the myth) she donned a corselet of armor and wore a white gown, is here represented by Elizabeth in a full suit of armor (and I'm sorry, armor should never, ever be designed by a costume designer! ), with leggings and no gown in sight, sitting astride a horse (and not sidesaddle as would have befitted a woman of any position) and galloping up and down in front of her troops, quoting Braveheart. There are other ways to make rousing speeches. And did I mention her leggings appeared to be made of silver lamé? The ugly - ok, the fact I had to sit through a part of this movie with my eyes closed because the camera just WOULDN'T STOP SPINNING. It's obvious that either the director or the cinematographer was so very in love with all the gowns that they felt had to show every single one from every single angle. This didn't allow me to appreciate the artistry of the gowns; it did make me decidedly motion sick. Also, remind me to find the person who invented digital grading and kick him really hard. You know, there are many times I miss seeing actual colors in action scenes. And of course, there was the enthrallment with symbolism. In one scene a horse goes crazy during the attack on the Spanish Armada, and jumps off the ship. We are shown all of this. It takes a couple of minutes. Then we are shown the horse swimming later. Um... ok. Don't get me wrong, I'm all for symbolism in movies, but not when it takes you completly out of any storyline and has no obvious connection to anything that you've been watching. I'm sure there's some historical symbolism of the horse and Spain, and thats fine, but spending several minutes in a climactic battle scene for a reason thats not going to be readily apparent to most of your audience? Ugly. 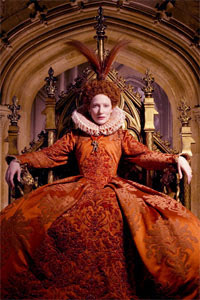 So turn your brain off, take a dramamine, and go see Elizabeth: the Golden Age, if only for the costumes. And Geoffrey Rush. And so you can tell me what the friggin deal is with that horse. The horse was for comic relief. Oh, and a tip of the hat to PETA, to show that they didn't throw in a horse that couldn't swim. Also for comic relief were the microphones, which you neglected to mention. There are boom mics hanging in about half the scenes of this movie AND we see and entire boom and mic in one scene, shot through a latticework. This film was entirely amateurish, technically. How does product like this get to market? Anyway, I probably had my eyes shut through the boom scene, as I was seiously motion sick from the camera work :). Thanks again!